Will do the Secret projects better be hidden well as ZOOITES are very good at Finding things! I suppose “Spot the Babies” sounds a bit too silly . . . and “Spot the Protos” too obscure . . . “Protostar Zoo”? I was going to say Nursary Zoo too, so my vote is for that. I like MilkyWayZoo as astrofrog suggested. 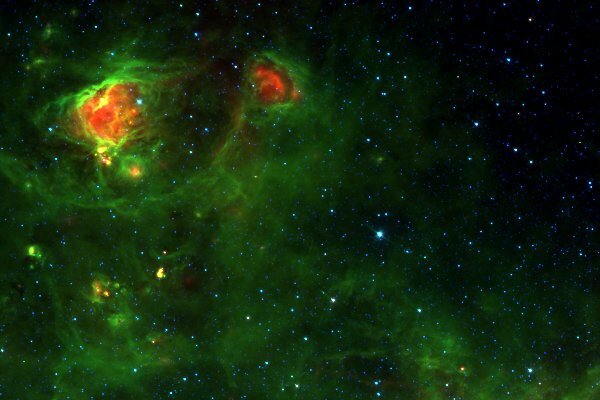 Maybe ProtoStar Hunters or Bubble Zoo?
. . . or “Project Nebulous” . . .
. . . shut up, Alice . . .
. . . by the way, I just made this Object of the Day. Spotting Baby stars should be something along the lines of ‘Stellar Nursery’ surely and a picture of a star in a nappy. Star Birth Zoo (as already suggested) seems a wee bit cumbersome, so I would second Alice’s Starbirth, but without the word Zoo, and written StarBirth. There are many precedents for two capitals in the same word like that (e.g. MasterCard, MySpace, YouTube, BlackBerry, PowerPoint) and I’ve even seen GalaxyZoo. How about – StarbonZoo or StarbornZoo ? The first one is better because it is shorter yet the sound – BON – reflects on both meanings of birth or born. On further thought – StarburstZoo may even be better along the same line of thinking. It is more vividly descriptive. How about “Stellar Cradles” ? My 2nd suggest is “Becoming a star”. Although I hate it myself : everytime I think about this project, BabyZoo comes to mind. Maybe it is not a good suggestion: As I now found out, the title of a book about astronomy contains this term. I had some other ideas, which I would liked to suggest, but when checking in the Internet, I found out that these are names of f.e. companies,films,games,cars. I am really looking forward to this new project, I suggest Nebulai Zoo. I had been leaning towards Nursery Zoo, but I think I like Star Cradle better. Besides I suggest *Newcomer Stars*. My vote goes to Stellar Zoo ! I think Arfon’s right, and there are already quite a few threads sitting rather uncomfortably in Galaxy Zoo that could be transferred into a Stellar Zoo to start it off. If it becomes Stellar Zoo, that could include the Supernovae . . .
‘Mr. Wiggle’s House of Stars’? No? Okay then, Stellar Zoo works for me. They look like a red eyes dragon (or frog) to me. Is Dragon in the zoo? I like Milky Way zoo because there are other things to discover in this dataset besides star formation. There are external galaxies, star clusters, supernovae remnants, and more! I tend to agree with M Povich that Galaxy zoo is best but it’s already taken! Hey there, just wondering why you don’t make a subsection “poll” in the forum, featuring percent and balks on suggested names, also for future polls. Assume the attention reaches more zooties in the forum. Just my2cent. @zooite – we don’t have a forum for Project IX. But I have added a poll to this page for the naming. Go vote! Wow, thanks Robert for the rapid update. I’ve voted stellar zoo, but since it’s evolving, how about stellar evolution project? I meant the Galaxy Zoo forum, because Chris pointed me here, I thought of the idea to implement a poll section there. Have added ‘The Milky Way Project’ as a user-friendly variation on TSEP. TMWP or just MWP if you like. I like ‘Stellar Evolution Project'(SEP)Nice and seasonal! On a serious note some of the other names may not carry enough weight. There’s a lot of research that’s being carried out and a lot of time being put in. Which some names could trivialise. Wow – with only a few hours left to vote, new entry: ‘The Milky Way Project’ seems to be gradually overtaking ‘Stellar Zoo’ FTW! In memory of Ed Wood, I humbly suggest “Project 9 In Outer Space”. What the heck? Stellar Zoo was vastly outnumbering it until the last minute! Ah well! I suggest the name “Stellar Zoo”, will be the right choice for this project.